The raspberry Bellini is a nice little Champagne cocktail. It is a twist between the simplistic styling of the Champagne cocktail and the fruity Bellini. It is another great drink from The Liquid Chef, Junior Merino. In the raspberry Bellini, Merino mixes the Brazilian rum, cachaça with fresh raspberries, a hint of lime and just a touch of sugar. It is very simple to mix up, yet the taste will impress anyone. This is one of those great brunch-worthy cocktails that you can mix up in minutes. It is best during the summer months when the berries are at their peak and better still if they come straight from your own raspberry patch. Muddle the raspberries, sugar and lime juice in a cocktail shaker. Fill with ice and add cachaca. If you have yet to taste cachaça, this is a perfect cocktail introduction. It is very similar in profile to the spirit's most famous drink, the Caipirinha. Both drinks are very clean and rely on fresh fruits, which is really where this style of rum shines. Leblon is one of the most popular cachaças available in the U.S. and should not be hard to find for most drinkers. If you get the chance, explore other brands as well because there are some very interesting options out there. If, by chance, you do not have or cannot find cachaça, use a good rum instead. Also, this cocktail is a perfect base for your favorite vodka. There are many bottles of Champagne to choose from. 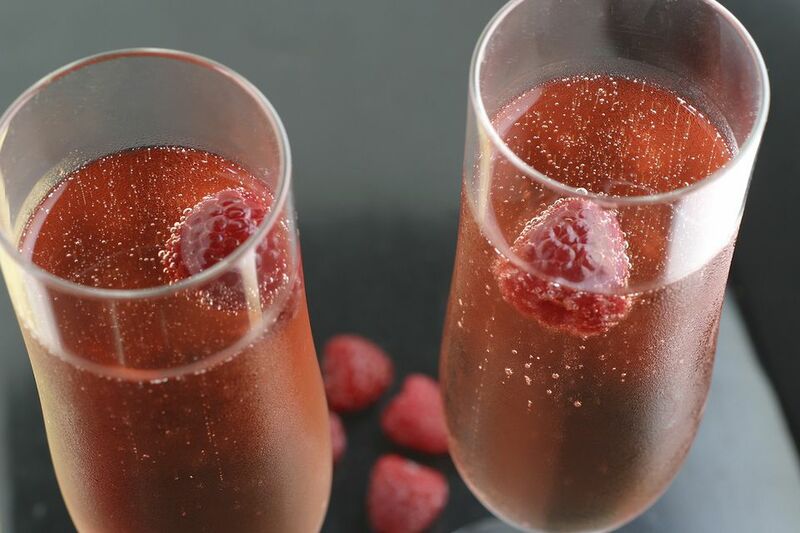 Quite honestly, you probably cannot go wrong with any of them in this Raspberry Bellini recipe. Deciphering Champagne labels can be tricky. Most importantly, know that 'brut' means the wine has a drier profile while those with the word 'sec' will be sweeter. I have tried both dry and sweet Champagnes in this recipe and both finish the drink off nicely. Fresh raspberries are not your only option here. If it is the dead of winter, dig into your stash of berries in the freezer and let them thaw before adding them to the cocktail. On the other hand, fresh lime juice is going to make a superior Raspberry Bellini. The great news is that the citrus fruit can be found year-round. Sure the price and quality change, but they are there and many of the bottled juices are going to add too much sweetness to the drink. The average lime holds between 1/2 and 1 ounce of juice, which is far more than the recipe calls for. If you want to get technical, a 'dash' is right around 1/32 ounce (or 1/5 teaspoon). Juice your lime into a separate glass and pour just a 'dash' into the shaker. There is really no need to measure this one! Go easy on the sugar! Remember that rums are sugar-based liquors and cachaça is made from pure sugar cane. There is no need to add more than a dash of sugar, particularly if you are using a sec or demi-sec Champagne. Superfine sugar is recommended because the crystals are a little smaller than granulated sugar. This makes it a just a little bit easier to dissolve in the drink. In a pinch, use your kitchen sugar and all will be fine. If you like, go with simple syrup rather than straight sugar. Depending on how concentrated your syrup is, just a dash will do. At times, I may even call the perfect measurement a 'drizzle' depending on the wine and rum. How Strong Is the Raspberry Bellini? Leblon is an 80-proof cachaca and if we were to use a 12 percent ABV Champagne, the Raspberry Bellini would be a relatively mild drink. We could estimate it to be about 18 percent ABV (36 proof) with a 4-ounce wine pour.